Welding is an ancient and useful art. It has become so refined nowadays that anyone can learn it. But before you unlimber that rental welding equipment and start firing it up, there are some things you need to know about. Knowledge of them will make your development of welding skills safer and easier. The first part of the equation is having the right equipment and learning how to operate it. You can start with rentals but you’ll most likely end up buying a set for your own workshop in the long run. The important thing as a beginner is to learn how to operate it properly. The core of it all is the welding machine. Don’t opt for a cheap welder. Try to work with high-quality components so that you won’t be disappointed with the results. There are several machine types that are good for starting out and can be used for a variety of welding types. You will also be getting some welding wire to do the job. This is relatively easy to find and inexpensive. The main decision you need to make is how thick the wire is going to be. A good rule of thumb is the thickness of the wire depends on the thickness of the material you are going to work on. Additional tools include hammers, scribes, and pliers. You’ll end up using them as you get more complicated projects, but on your first weld, they’re not that necessary yet. What cannot be skipped is the protective gear that you are going to need. Welding is a dangerous job and protective gear ensures that you don’t end up with burns or worse injuries. 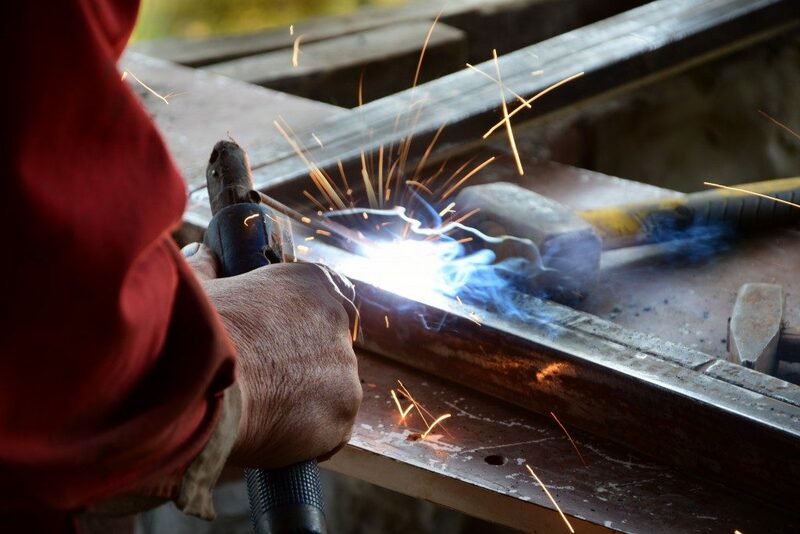 Experienced welders maybe a lot more blasé about the potential harm that welding can do, but as a beginner, you are most likely to get hurt. That is why you should have a fire-resistant jacket for general protection, gloves for your hands, and safety glasses to protect your eyes. The most important piece, though, is the helmet. A good auto-darkening helmet will protect your face and allow you to work unimpeded. It’s not just what you will be wearing. Your workshop should have a great ventilation system and a good clear space where you can be allowed to let the sparks fly. There also should be no flammable materials near your work area. Now that you’ve got everything ready, you’ll need to learn the basic skills that every welder needs. The first one is knowing how to prepare the metal. This removes all the oil and dirt on the metal so that the weld is done cleanly. This is done by an initial cleaning and then grinding of the portions that will be joined. Then there is the positioning for the weld itself. The main portion of welding is done by layering the weld on the materials that you are joining. Like a gold swing, your goal is to have few moving parts but still being fluid in movement. When it is done, you may need to learn how to grind away the weld so it looks presentable. Welding seems intimidating at first glance, but with some practice and study, you should be doing it like a pro. With these skills under your belt, there should be nothing stopping you from tackling any of your dream projects, whether it is for artistic or more practical purposes.